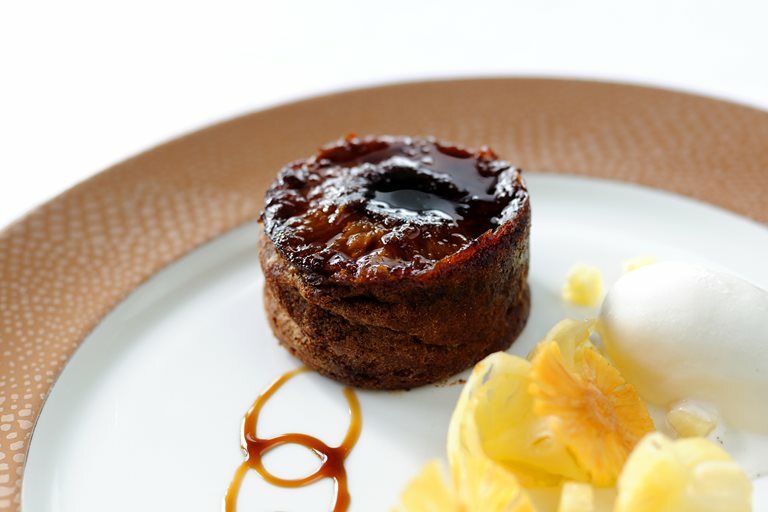 A delicious dessert with a Caribbean slant to it, this pineapple cake recipe from multi award-winning chef Robert Thompson is a great change from the more traditional fine dining puds. The mascarpone sorbet is a wonderfully creamy accompaniment to the pineapple and ginger cake, and the overall dish is wonderful to enjoy as a dessert at any time of the year. Preheat the oven to 180°C/Gas mark 4. Cream the butter and the 35g of sugar together in a bowl, add the egg, ginger and black treacle. Fold in the self raising flour. Take 100g of your leftover pineapple trimmings and boil with the water in a large pan. Pour the pineapple/water mix into a blender and blend until smooth, add the bicarbonate of soda and mix well.